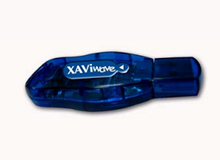 XAViwave XW501B, a 54 Mbps Wireless LAN USB 2.0 Adapter brings blazing fast connection to either your desktop or notebook PC. With its advanced 2.4GHz 802.11g digital radio transmission and embedded antenna technologies, immediately you are free from the bothering cable wiring and troublesome adjusting of the external antenna. Even more, your wireless transmission can be secured by selective WEP, TKIP, AES or WPA encryption without sacrificing performance. Compliance to the 802.11g standard makes sure it works with existing 802.11b and 802.11g networks. XAVi XW501B is actually a ZyDAS ZD1211 USB 802.11b+g Wireless LAN card.